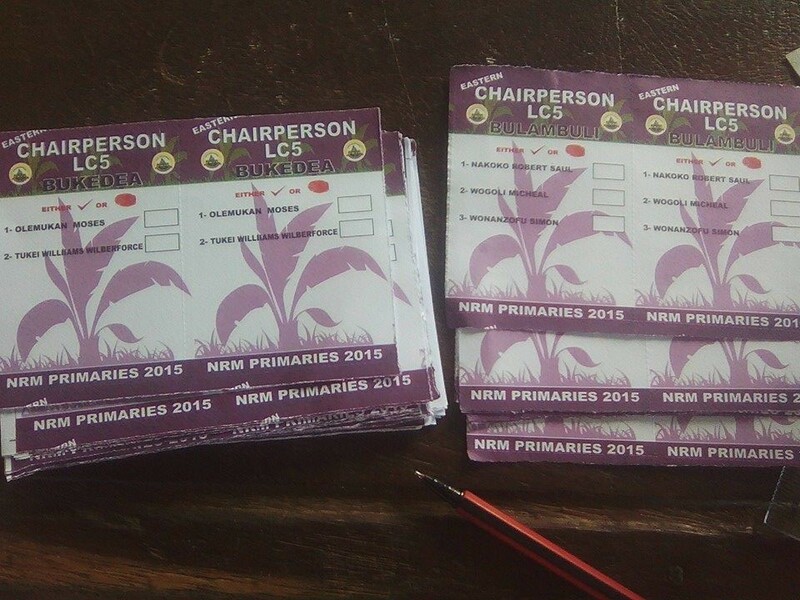 NRM Primaries continues and is impressed by how they do it! If you want some intersting news and reality check just check how the ruling party of 29 years has issues in their own internal elections. The rigging is so functional that the district without pre-ticket ballots should be showered with gifts from the leaders of opposition. Why? Because in the areas without election rigging the leaders of NRM might have some real character and not just buying the votes or pre-ticking the ballots which is easy. The funniest kind of voting is happening in Hoima and Bunyoro today where the chief of the area has decided despite not having ballot-papers and election material they started to vote with WhatsApp. Read the reports from the elections today! They are magnificent. Ofwono Opondo said this today: “Because of this, elections for special leagues of NRM have been pushed to 30th October. They will report on 29th” (…)”Kiruhura elections have been halted after death of one of the contestants in un clear circumstances”. Ofwono Opondo said also this: “The National Resistance Movement has so far spent 5.5 billion shillings on the ongoing primary elections countrywide” (Nakatudde & Labeja, 2015). Ofwono Opondo says: “party agreed to extend voting time from 4 pm to 5 pm, because of delayed delivery of voting materials” (Nakatudde, 2015). Mr Muhindo said this today: “I must say this before you without fear or favour because we have seen President Museveni lose at polling stations where policemen vote from. You must know that NRM is the sitting government which you have to support for your brighter future”. Opondo there was pictures of the crashing car in Kiruhura yesterday, is that unclear circumstances? ‪Mr. Muhindo support NRM for a brighter future? You guys can’t even hold a clean internal election! Look at the evidence for yesterday and today. 5.5 billion Shillings that is a lot of monies for such much postponement and rigging surely some of that has gone to the ones that tries to buy the votes in the district. 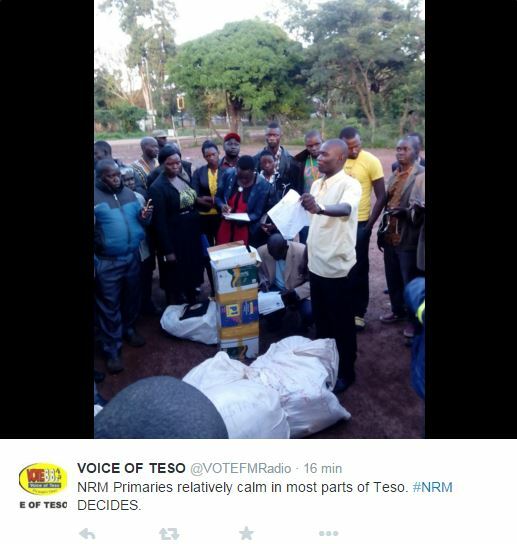 Not only to the producers of the ballots in Kenya where NRM has bought the Ballot-papers and printing jobs from. Did you know that? Rogers Mulindwa the head of media and public relations as apologies for the irregularities and he believes the NRM has infiltrated by moles (And he is not kidding!). There has even been seen that Police officer in full uniform going into the election and voting. Surely the Ugandan police is not partial at all in this coming General election! The primaries for Busiro North have been called off after reports of a certain candidate not being on the ballot. 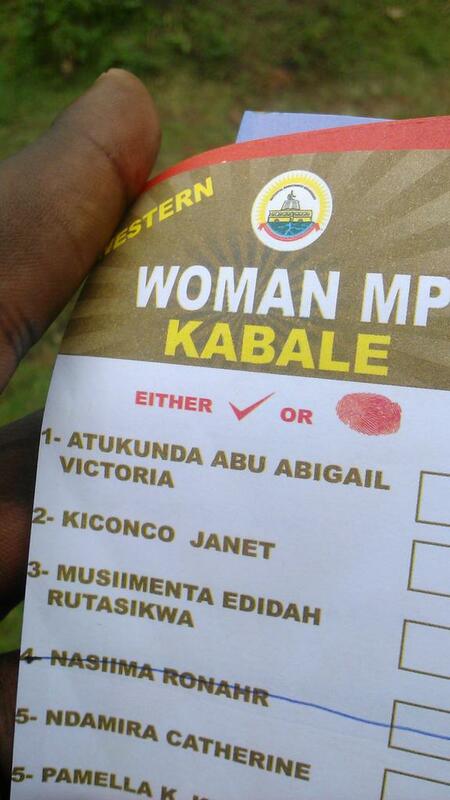 Annet Bakunzi was not even on the ballot. To further the foolishness in the area MP Tinkasiimire actually scared voters while carrying a gun to get them to vote. Mr. Al Hajj Moses Kigongo went to Lwengo to calm protesters between the fractions. After this the elections has been called off! There been reports of already stuffed ballot boxes before starting the actual voting and they have been sitting in the NRM Registrar’s Office. 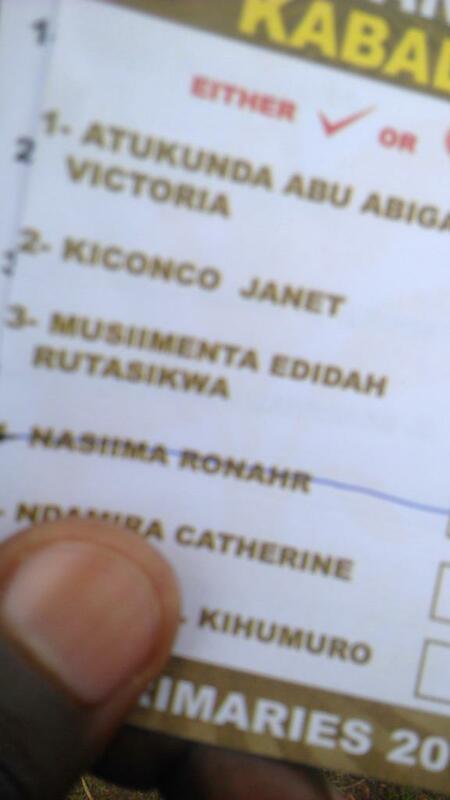 In the sub-county of Ayivu the ballot papers missed a lot of candidates. These we’re MP and Flag bearer for the area Ben Dravile, also Simon Avutia, Alex Adia and Moses Etukibo. MP Jessica Akabiku has had a team that was mobilizing in the area to a certain extent that they was caught buying voters and paying voters for their votes; as much as the police has a mobilization team in custody. Lt. Gen. Charles Angina has arrest 7 persons alleged for election violence in the area. They are at the police station and in custody. In the Kasoka Polling station there was delivered ballot papers for another district which is Bulambuli. There been found ballot-papers supposable found in Bushenyi in Igara East. Yet, another place where they got the wrong ballot-papers! The people of the area are staring to questioning the election with the delays of material to their party secretariat so they can distribute the voting material in the county. Two hours later the famous Katongole Singh has cast his vote! And the election has started there. It’s called off and postponed for the moment. That is because Henry Banyenzaki was taken with 16,000 pre-ticket ballot-papers. So there you have the reason why it was postponed. In Chua East there was a wrong person on the District Woman MP. The one set up on the Ballot was Lucy Rose Achan on the District Woman MP instead of being set on the ballot for the directly MP for the District. That has led to postponement of the local election. “In Lyantonde district, a retired soldier identified as Sergeant Abel Kafuruka has been knocked dead by a convoy of four cars belonging to the incumbent woman MP Grace Namara Lutemba Kirumira which were reportedly carrying pre-ticked ballot papers. This came after the late tried to block these cars as he was waited for his candidate Pauline Kemirembe Kyaka to arrive. This incident happened at 1:00am at Seeta village in Kinuuka sub-county. The DPC of Lyantonde Rogers Kapere confirmed the incident and said the car which knocked the late is a premio registration number UAW 442L and the driver is on the run. Meanwhile two cases of assault have also been opened against the Kabula Mp James Kakooza for beating a Councillor of Kooki C in Lyantonde town council and a journalist attached to Vision Group Sadati Waligo who were following him as he tried to give bribes of 5000 notes to voters in Kaliiro sub-county. James Kakooza famously remembered for leading the debate for lifting term limits and his wanting academic papers which made the parliamentary vetting committee to throw him out of the Primary health care ministry where he was re-appointed lost the race for NRM district chairman and is now struggling to retain his parliamentary seat for the fourth time – (Source: Godfrey Ssali – Radio one). Ballot papers that were supposed to go Kibaale went to Luweero District. The Ballot-Papers that was supposed to be sent to Moroto was forgotten in Kampala. 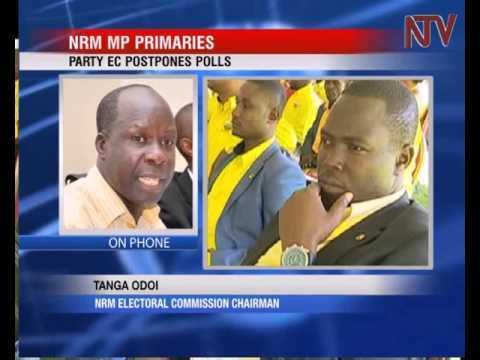 In Soroti the NRM-EC forgot to deliver Ballot-papers too, the same as happen to the people in Moroto. In Budaka District they got ballot-papers that we’re supposed to go Soroti. 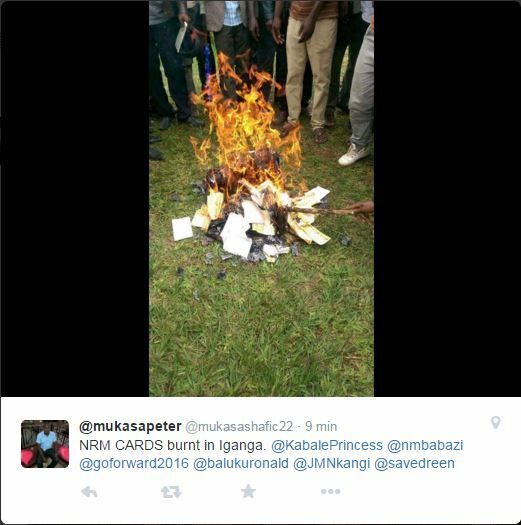 Because of malpractices in the election members of the NRM has started to burn their membership cards in Iganga. 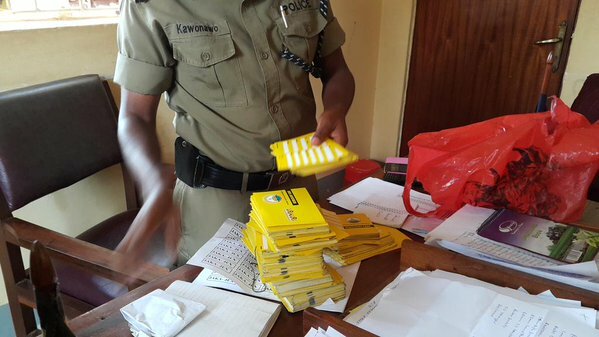 The Special Forces Command taken into custody two full boxes of pre-ticket ballot-papers for Kangwagye. MP Bright Rwamirama Kanyontore has also runs in the election for MP in Insingiro North have actually gone to the local market where he was trying to buy votes from the local police and UPDF guards in town. They have found pre-ticked ballots in the town. Henry Muganwa Kajura the MP of Hoima has ordered the polling to start even without ballot-papers. There been rumors that they have accepted votes through WhatsApp. The voting material comes from Fort Portal Central Police Station to the districts in the area. And the journalist are not allowed to follow the elections. In the Rwampara Constituency had delivered voting materials as ballot-papers and ballot-boxes. The ballot-papers was pre-ticked for the one MP candidate and no other candidate to vote for, that was for MP Vicent Mujuni Kyamadiidi. The Ballot papers for local mayors in the municipality were not to get in the election. Election in Masaka has halted. Kintu Musoke has found his car full of stones and kiboko. Kahinda Otafiire the elected for Ruhinda County in Mitooma District has been seen on the Ballot-papers in the greater Masindi area. The Nakaseke NRM Register Paul Tandeka has told that on the ballot in Nakaseke South had the Nakaseke North MP. The Police chief arrested the pre-ticket ballot-papers that was ticket for the candidature of Sarah Muwonge Nkonge for Woman MP. Sarah Nkonge and Isaac Sejjoba the MP of the Bukoto Midwest was caught with 7000 pre-ticket ballot papers! George Mutabaazi and MP for Buyaga County Barnabas Tinkasmiire was put into jail over night for the vote rigging in the district. Michael Mbirimu is also into custody after tempering with the ballot boxes in the area. Here there found ballot-papers belong to Kabale; yet another place where the NRM-EC has delivered the ballot-papers to the wrong location. In the sub-county Erussi the chairman Mr. Odubi has been found with pre-ticket ballot papers. There been found 3,000 pre-ticket ballot papers was ticket for the candidate of Allan Kajjik, which is the husband of the Minister Anite Evelyn. The local favored candidate Padyere will then be denied his possibility to run for the sub-country area because of the rigging. In the area there been people stopped from voting, but still they are registered to vote. Actually a place where there is peaceful elections today. The place of the violence of FDC rally is a silent and peaceful paradise in the midst of the madness. There been reports of violence and ambulances. Bloody clashes around the election! Apollo Mubiru was reporting! After yesterday’s violence and shootings there is rising a tension in the town today. Local NRM candidates of Nkarubo and Sekikubo have been publicly fighting. There been reports that the Independent candidate of Riita Rhona has been on the ballot-papers. Been calm and well spent election in the primaries there. Good to hear that some areas has it peaceful. Voting today has been postponed. The ballot papers miss certain candidates for MPs and one of the mayoral aspirants is even missing on the same ballot-paper. Found bunches of fake party cards and the DPC of the area shows pictures of it. They were found in running Mayor Jacob Kafureeka’s house. 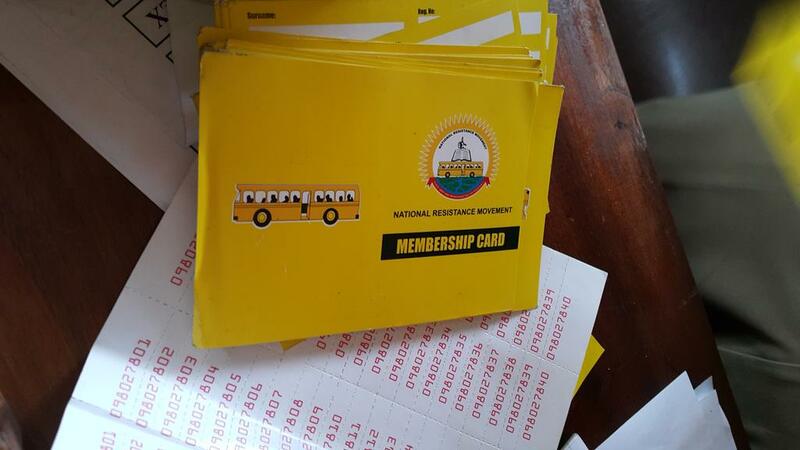 Matayo has been caught with over a 1000 fake NRM cards. 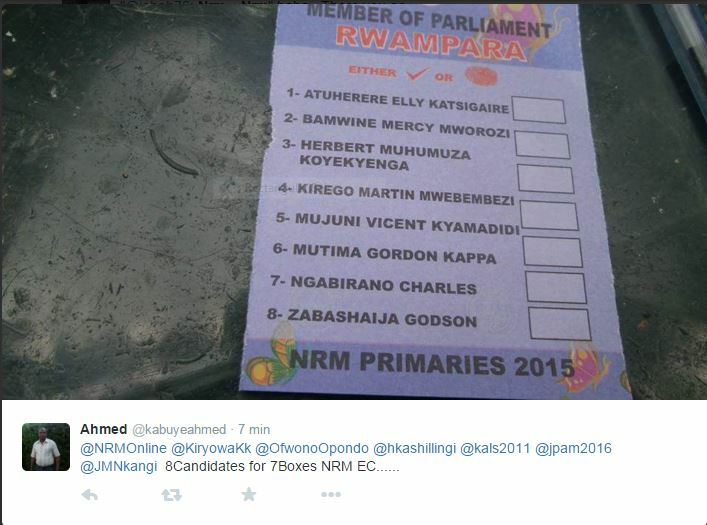 On the MP ballot papers was pre-ticked for candidate Yonah Musinguzi. There been pre-ticket ballot papers in the districts for the candidate for Nekesa Barbra Oundo who is the state minister for Karamoja that she is contested for the seat in the sub-country Bugwe North. Also to top it off on the ballot papers delivered they didn’t have Gideon Onyango. Barbra Oundo Nekesa is contesting for re-election as the Woman MP for the Busia District. Because of these irregularities the election is now cancelled and will be postponed. In the district the police have put the NRM Flag bearer into detention. Mr. Bitera has been charged for vote rigging, in meaning pre-ticketing ballot papers. As he still is in custody the elections continues and the other candidates are Limtho and Tampo Amin. An Tampo Amin is the grandson of Idi Amin. There been reported of heavy meetings in the main office of the election after how the Primaries are going in the country in Kampala. Yeah, this looks good before the General Election this coming 2016. Nope, the ruling party can’t even run a decent internal election without violence, rigging or the police involved. The amount of postponement should also lead to Dr. Tango Odoi to get a new job or might even go back to lectures in Makerere University. Instead of this rigging nonsense; Where it’s so much chaos and making the NRM is officially short for National Resistance Movement. 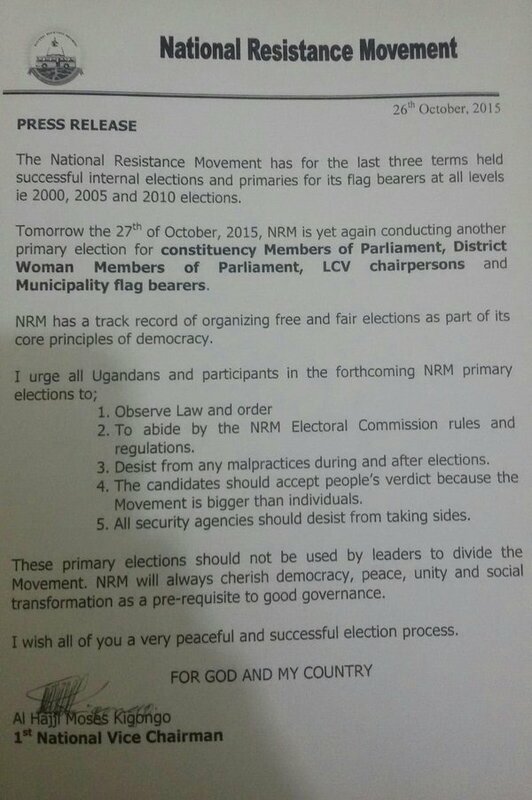 Instead the NRM should be now short for National Rigging Movement. Dr. Tanga Odoi, do you agree? Peace.